Seven swans-a-swimming and more books to choose from! Joy Berry Classics are broken down into series, from the Teach Me About series for toddlers to the Winning Skills books for tweens. The messages these books convey are timeless. Children will always need potty training, will always whine, fight with their siblings and need to cope with emotions such as anger and the challenge of doing well in school. These topics are only a sampling of the issues the Joy Berry Classics address, but demonstrate why Joy’s books are relevant and necessary today. 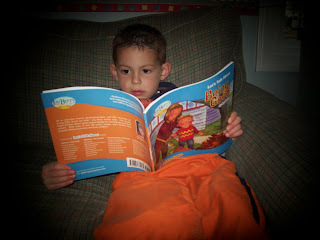 Joy Berry’s books empower children to help them learn for themselves. These materials are time-tested and really work. Millions of parents and educators have used these books to help children learn responsible behavior, deal with their emotions and cope with trauma. So what can you win? An assortment of books from the Teach Me About and Help Me Be Good Series, and you could also request certain other books that you think would benefit your child(ren)!! So be sure to check out the whole website! Sure he's reading about "being good" but he's secretly plotting ways to drive his mother crazy. Trust me. Simply leave a comment below and you are entered to win your choice of books!!! No e-mail No blog? Then how will I get in touch with you?! Make sure you leave me your contact info. Hello, visiting from SITS, good luck with your giveaway! Great ideas for books! I could use them for each and every age with the daycare kids as well as my own!! these would make great gifts for a little devil I know. Oh. Please. Send some this way! Sounds awesome! Thanks for the opportunity! Oh YAY! We are book -sponges around here! COOL! would love a chance at those! With a 2 and a half year old I will take any and every book I can get! Love books, esp. for my wee one! Thanks for the chance!